You may have seen slightly less spam coming into your email inbox recently, but those messages were more likely than usual to contain a virus, according to a report by Google. The amount of spam being transmitted dipped slightly in August and September, the study found. 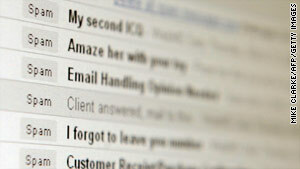 Spam in the third quarter of the year was down 24 percent compared to the same period last year, the report said. In August viruses in emails processed by Google increased by 111 percent, compared to the same month last year, the company said in its statement. Google's system blocked a record-setting 188 million emails containing viruses in just one day. This malware is increasingly being housed in messages purporting to break news about a celebrity's death. The virus can unleash itself when the recipient clicks on a file attached to an email. For the study, Google analyzed more than 3 billion messages processed by its system each day during a three-month period.